Happy Friday, dear friends! 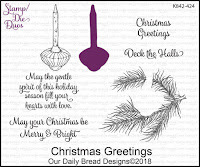 My stash of Christmas cards is growing, but I still need many more, so my Christmas card for today was made with some new stamps and dies released from Our Daily Bread Designs this month. 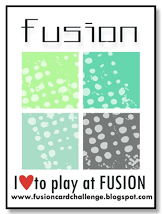 Created Nugget: The Side Step Card Die was used to make the base for this card. The papers used are from the Christmas Collection 2014 Paper Pad. I had fun creating Distress Oxide panels on mixed media paper to match the colors of the designer papers. 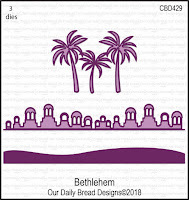 The Oxide panels were cut with the Bethlehem Dies to create the city of Bethlehem layered on each step of the card. 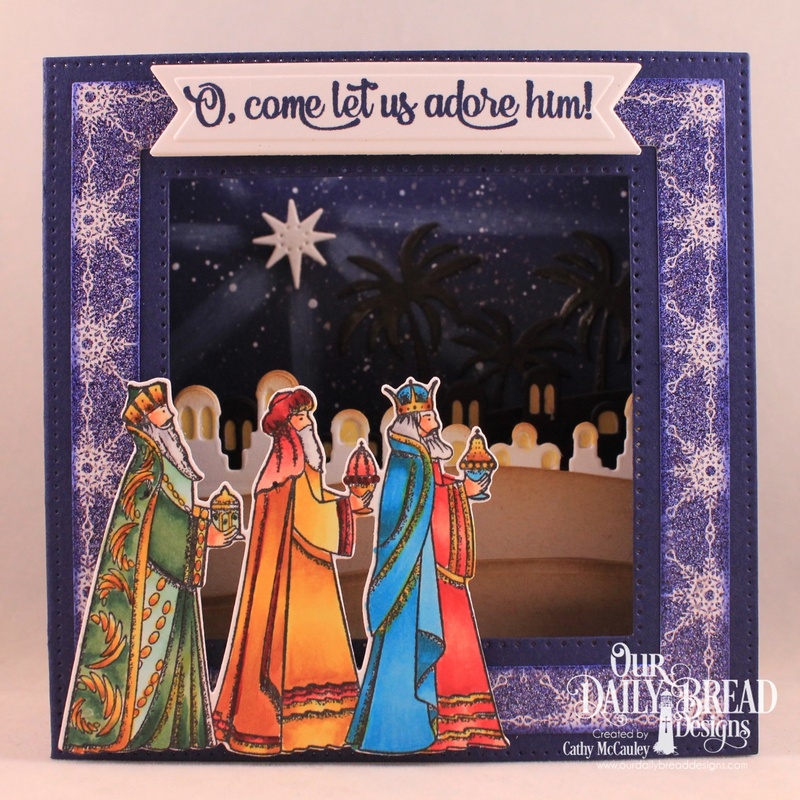 The wise men from the Great Joy Stamp/Die Duo were colored with Copic Markers and cut with the coordinating die. 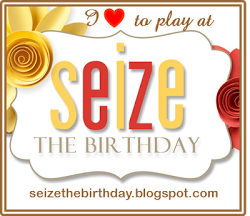 The sentiment from the stamp set was split and embossed on two different layers of the card. Another Christmas card finished! Thanks so much for stopping by! Hope you have a wonderful weekend! Hello friends! 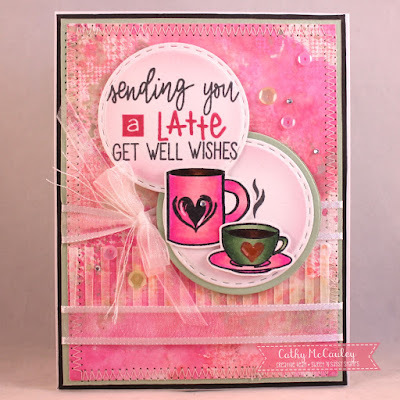 Today I am sharing some cards over on the Sweet 'n Sassy Stamps Blog using some of the new products released this month. 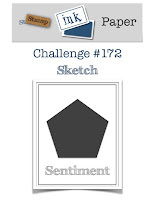 I'm loving the plaid textures in the Texture Tiles 4 stamp set for creating backgrounds. Since we are nearing the end of October, Breast Cancer Awareness month, my first card features pink get well wishes. 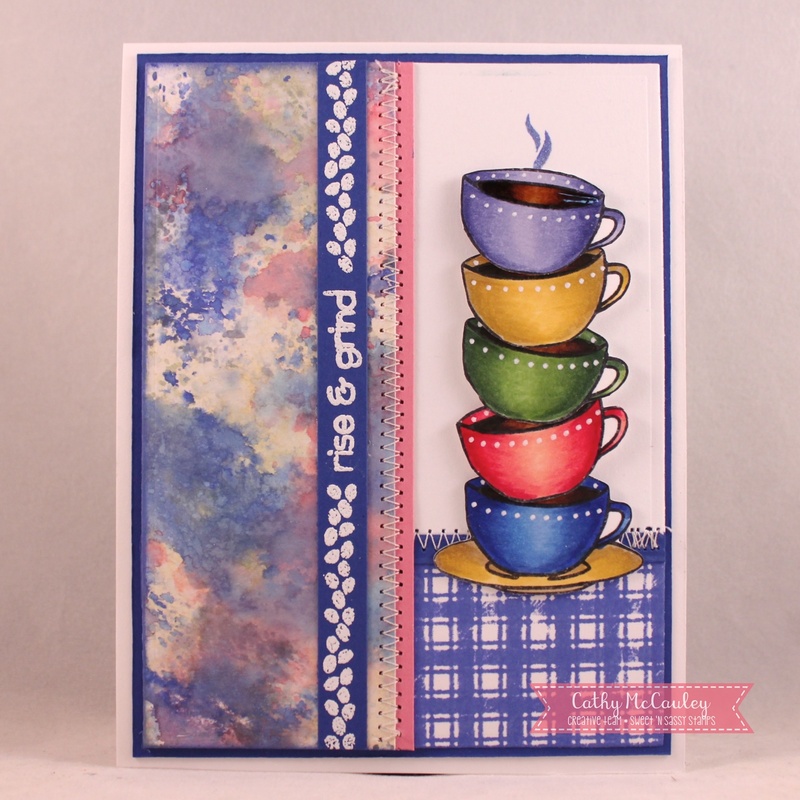 Creative Nugget: The background was created with Oxide Inks and one of the plaids from the Texture Tiles 4 stamp set. Some Texture Paste was added through a striped stencil for added texture. The coffee cups are from the Jesus & Coffee stamp set and were colored with Copic Markers. The sentiment is a mixture of words from the Jesus & Coffee and Scripty Thoughts sets. A bow and sequins finish the card. 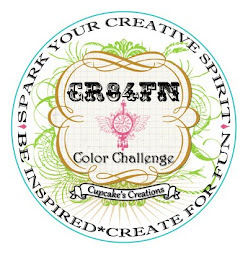 Creative Nugget: How about these non-traditional Christmas colors? Another Oxide Ink background stamped with a plaid from the Texture Tiles 4 stamp set was used for the base of this card. (***Who needs patterned paper when you have Oxides and Texture stamps?) 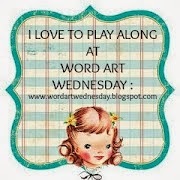 The sentiment is from the Christmas Word Art stamp set. The diagonal panels were also made with Oxide Inks and textures from the Texture Tiles 1 stamp set. The package from the All Wrapped Up stamp set was colored with Copic Markers. Add a little bit of colored twine and Bitty Sparkles to finish the card! 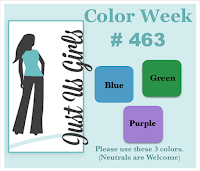 Thanks so much for checking in...have a wonderful day! Good morning, friends! Today we are taking another look at the ODBD October 2018 Release. October's release is perfect for your Christmas crafting! 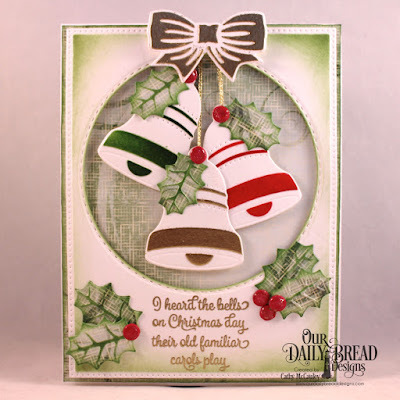 My sample uses the new the Christmas Card Verses stamp set and the Diorama With Layers Dies. Creative Nugget: The fancy fold card base was cut with the Diorama With Layers Dies. Christmas Collection 2014 papers were used for the layers on the diorama. The decorative panels were cut with a combination of dies...the City Skyline Border, one of the Bethlehem Dies, the Neighborhood Border which was used to cut mixed media paper and watercolored, and a Cloud Border. The sentiment from the Christmas Card Verses was gray embossed and an organdy bow was added to finish the card. Hello friends! 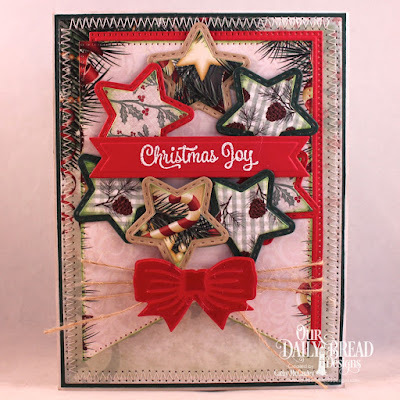 It's Throwback Thursday over at Our Daily Bread Designs and the features for today are the Sparkling Stars Dies and the Double Stitched Stars Dies. Star dies are so versatile...they can be used for almost any occasion, even Christmas! Creative Nugget: The Double Stitched Stars Dies were used to cut kraft, red and green card stock while the Sparkling Stars Dies were used to cut papers from the Christmas Collection 2017 Paper Pad. the stars were layered and mounted to a circular wreath shape cut with Pierced Circle Dies. Coordinating paper was stitched to the card base and the Large Banner Dies were used to cut the banners on which the star wreath was mounted. A sentiment from the Christmas Card Verses stamp set was white embossed on a Pennant Flag die cut. 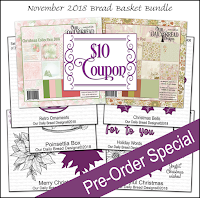 The banners were wrapped with twine and the clear embossed bow was cut with one of the Christmas Bells Dies...a new die from the November 2018 Bread Basket Pre-Order Bundle. 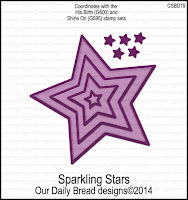 To see more samples using the Sparkling Stars Dies and the Double Stitched Stars Dies head on over to the Our Daily Bread Designs Blog. Hello everyone! 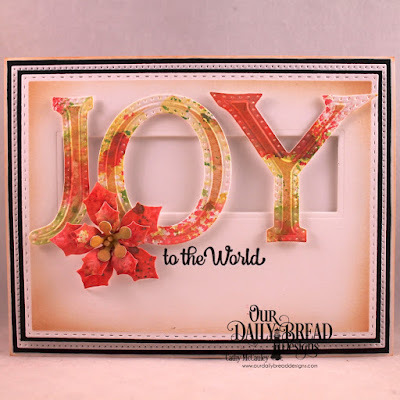 Our Daily Bread Designs will be releasing some wonderful new stamp and die sets in November that are perfect for your Christmas crafting. 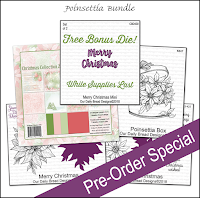 Since it is not too early to begin crafting for Christmas, these new product bundles are available now for pre-order...and even better the bundles are available at a discount. Some of the papers and dies from the November 2018 Bread Basket Bundle were used to create my card for today. Creative Nugget: A Double Stitched Circle Die was used to cut an aperture window from a card stock panel cut with a Pierced Rectangle Die. A sentiment from the Christmas Card Verses Stamp Set was gold embossed on this panel and sponging was added. Paper from the Christmas Collection 2018 was mounted to the card front behind the window. The Christmas Bells Dies were used to cut and emboss the bells, bow and holly leaves. These were sponged while still in the dies and were clear embossed to add some shine. The bells were hung with gold metallic thread to show through the window. 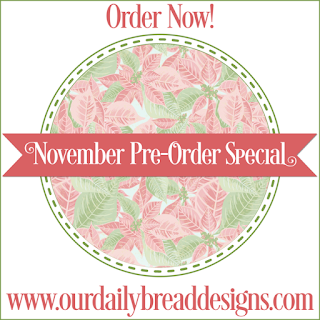 Be sure to stop over at the Our Daily Bread Designs Blog to see more gorgeous samples using the Pre-Order Bundles created by the talented Bread Stick Designers. 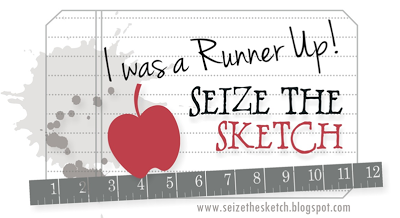 Thanks so much for stopping by...happy shopping...happy stamping! Hello, friends! 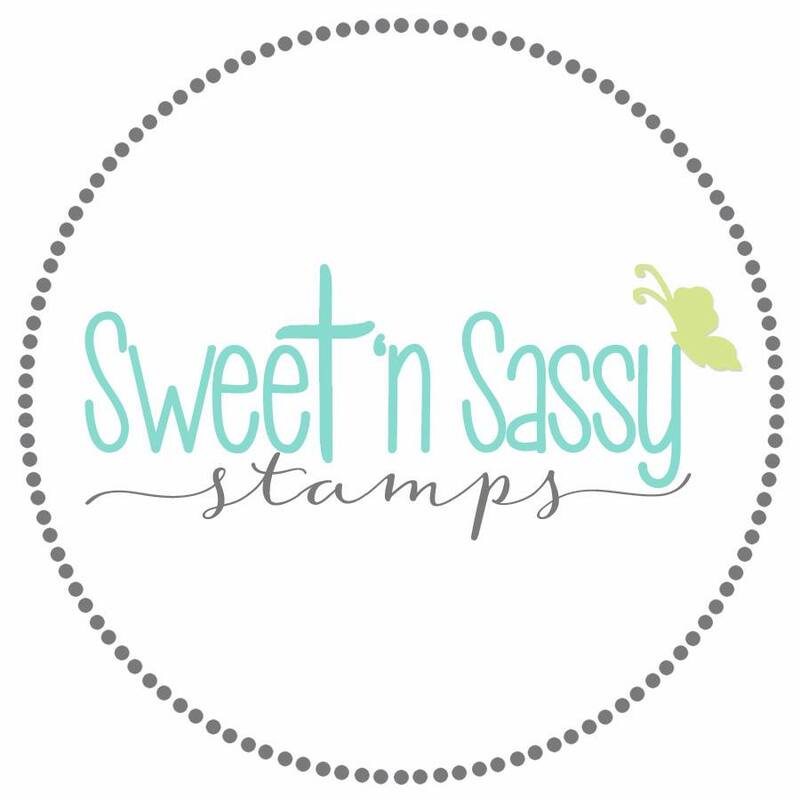 Today I'm sharing two cards over on the Sweet 'n Sassy Stamps Blog using some of the new stamp sets from the October release. Distress Oxide Inks were smooshed onto a mixed media panel and then stamped with one of the plaids from the new Texture Tiles 4 stamp set...after all, who does't love a warm, cozy flannel plaid? This panel was cut apart and the parts were used to create both cards. Creative Nugget: One of the plaid sections was stitched to the left side of this card. The snow globe from the Winter Wonderland stamp set was filled with some of the small images from the set to create a winter scene. 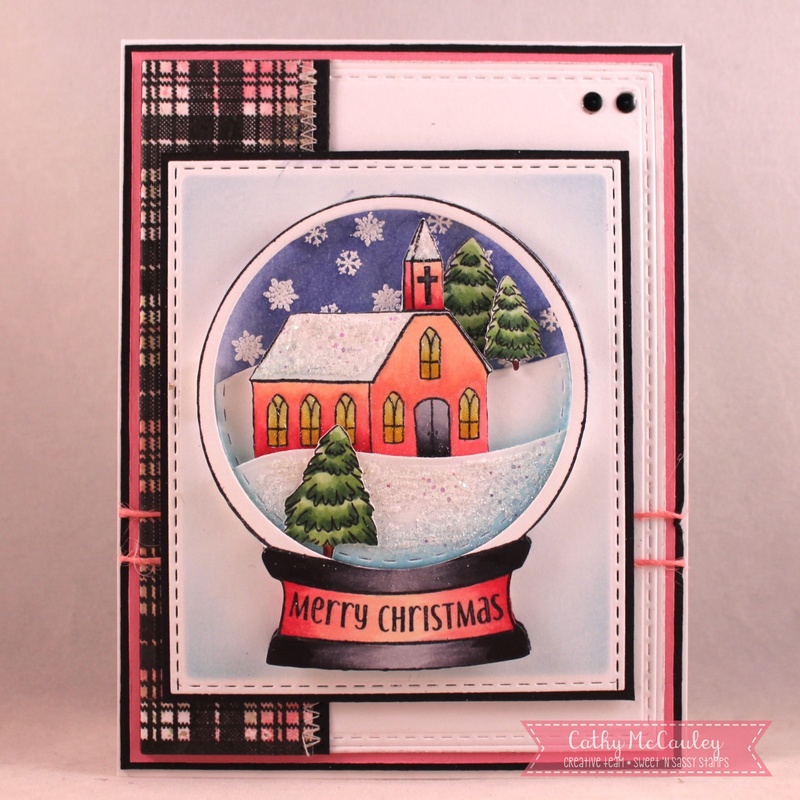 A little sparkle was added to the snowy slopes and Glossy Accents applied to the windows on the church. 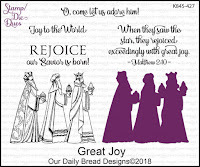 Although I am not a coffee drinker, the Jesus & Coffee stamp set is wonderful for creating cute cards for coffee loving friends and Bible journaling pages. Creative Nugget: The other plaid Oxide Ink section was stitched to the center of this card. The different mugs and cups from the Jesus & Coffee stamp set were colored with Copic Markers, cut out and popped onto the card. 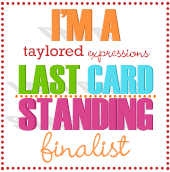 The sentiment was made with words from the So Thankful and Jesus & Coffee stamp sets. Sequins were added to finish the card. 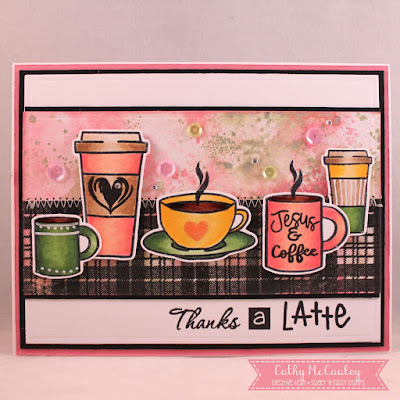 Thanks so much for stopping by...Happy stamping until next time! Hello friends! 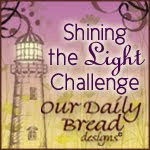 It's time for another Two for Tuesday feature over at Our Daily Bread Designs. It's not too early to begin working on those Christmas cards. Creative Nugget: For the CAS version of my card, layers of white and black card stock were cut with Pierced Rectangle and Double Stitched Rectangle Dies. A window was cut with one of the Tri-Shutter Layers Dies. Letter J, Letter O and Letter Y dies were used to cut mixed media paper smooshed with Distress Oxide Inks. 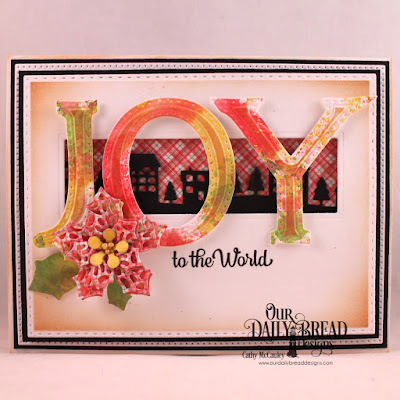 The sentiment from the Great Joy Stamp/Die Duo was stamped under the letters after masking off the word "Joy." The poinsettia accent was cut from the left over mixed media panel using the Peaceful Poinsettia Dies. Creative Nugget: Paper from the Holly Jolly Collection and a Neighborhood Border die cut were added behind the window on the stepped up version of my card. Extra layers on the poinsettia were cut with the Merry Mosaics Dies from the same sheet of designer paper. ABC Christmas Challenge - "U is for Upon" and "V is for Very Quick"
Hello, friends! 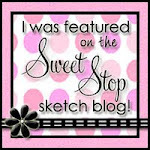 Today I'm playing along with Freshly Made Sketches 357 and some new stamps just released by Sweet 'n Sassy Stamps. 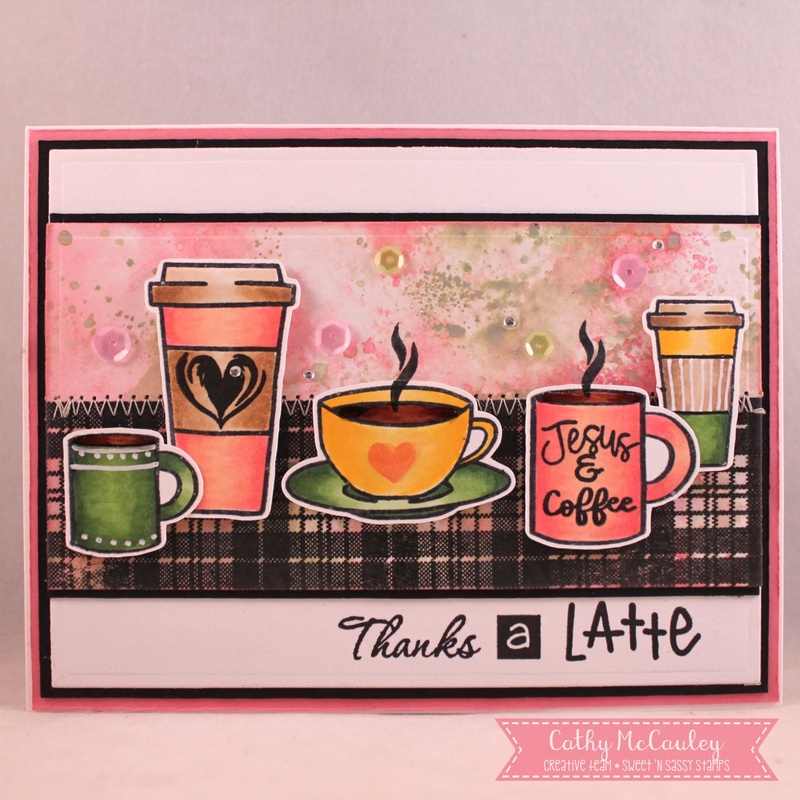 This card is for all of you coffee lovers out there...(I'm going to pretend that these are cups of hot chocolate)! Creative Nugget: Blueprint Sketch, Antique Linen, Worn Lipstick, Bundled Sage, and Iced Spruce Distress Oxide Inks were used to create the "Smooshed" panel on the left. 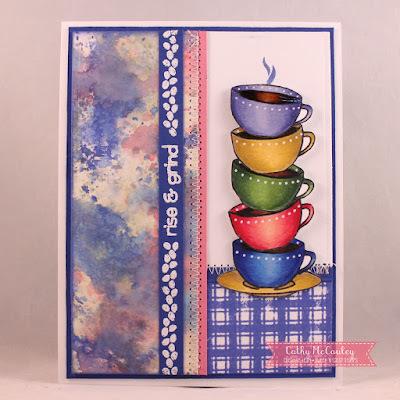 The plaid is from the new Texture Tiles 4 stamp set and the colorful coffee cups from the Jesus & Coffee stamp set were colored with Copic Markers, cut out and popped onto the card. The sentiment is also from the Jesus & Coffee stamp set and was white embossed. Stitching was added to finish the card. Thanks so much for stopping by...have a cuppa for me! Hello friends! 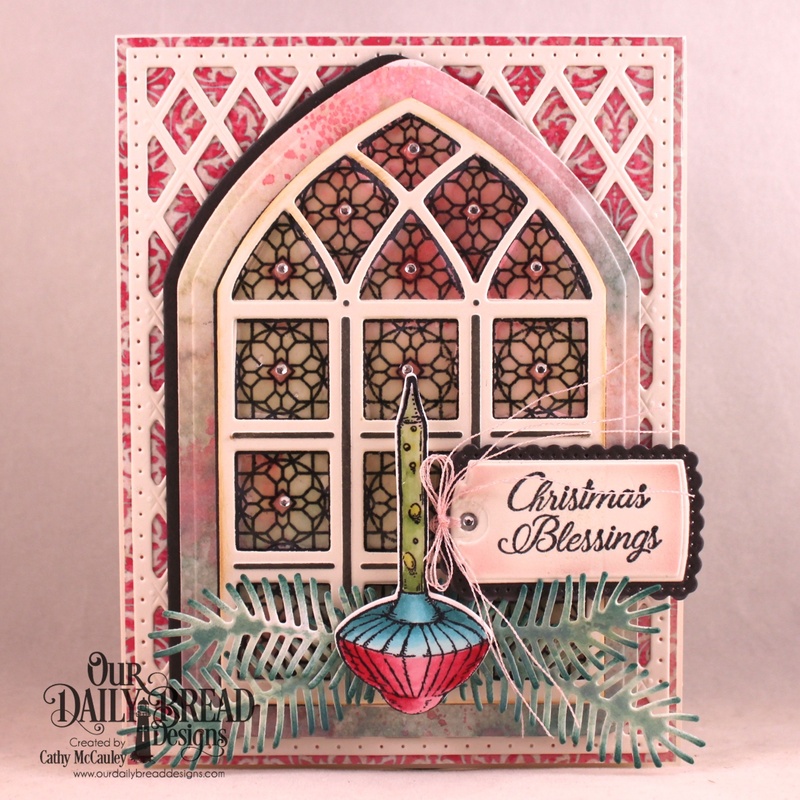 It's Throwback Thursday over at Our Daily Bread Designs and the features for today are the Cathedral Window Die and the Cathedral Window Marble stamp. The Cathedral Window products are beautiful and are perfect for any occasion, but I chose to make a Christmas card. 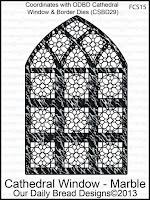 Creative Nugget: The Cathedral Window Marble was stamped onto a Distress Oxide panel, cut with the Cathedral Window Die and the stained glass panes were covered with Glossy Accents. Gray and cream card stocks were also cut with the die and layered to make the window which was popped onto a Lattice Background die cut and paper from the Christmas Paper Collection 2014. The vintage light from the new Christmas Greetings Stamp/Die duo was used to decorate the window for Christmas along with some greens cut with the Pine Branches Dies. The sentiment was stamped on a tag cut from the A Gift For You Dies. 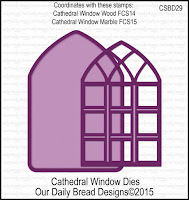 To see more samples using the Cathedral Window Die head on over to the Our Daily Bread Designs Blog. Hello, friends! 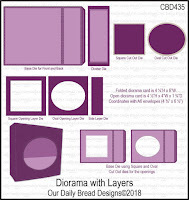 Welcome to the Our Daily Bread Designs October 2018 Release. It's not too early to begin thinking about all of those Christmas cards you will need for the upcoming Christmas season. 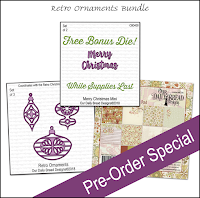 This month's ODBD release is filled with wonderful stamps sets and dies perfect for your Christmas crafting! 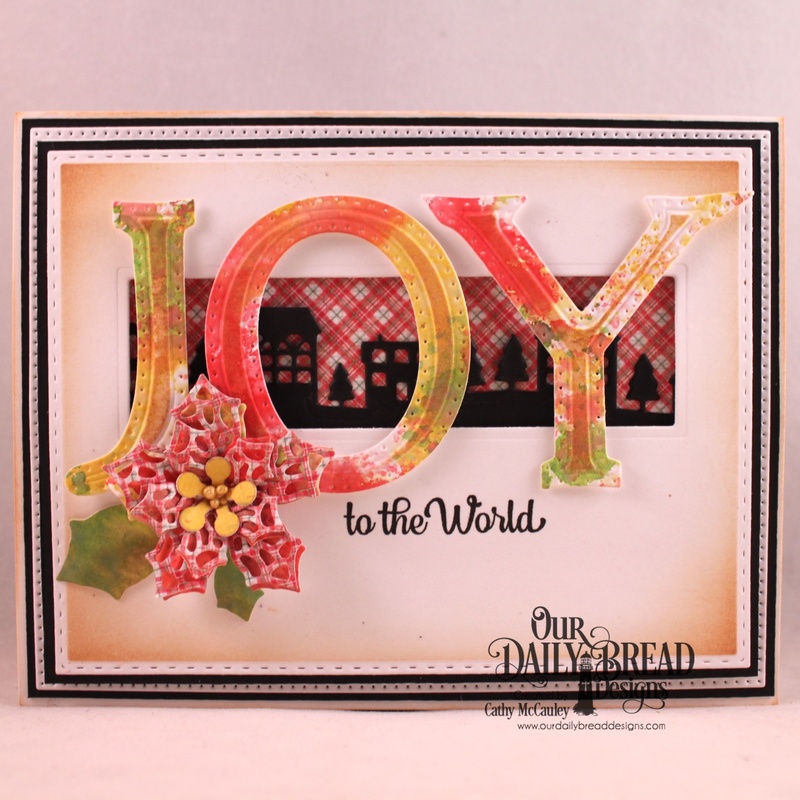 My first sample was made with the new Great Joy Stamp/Die Duo, the Diorama with Layers Dies, and the Bethlehem Dies. Creative Nugget: The Diorama Dies were cut from card stock and the Diorama Layers Dies were cut from papers from the Christmas Card Collection 2016. The back panel of the diorama was splattered with acrylic paint and rays were sponged with white ink. One of the Splendorous Stars Dies was used to cut a star for the night sky. The wise men from the Great Joy Stamp/Die Duo were colored with Copic Markers and cut with the coordinating die. 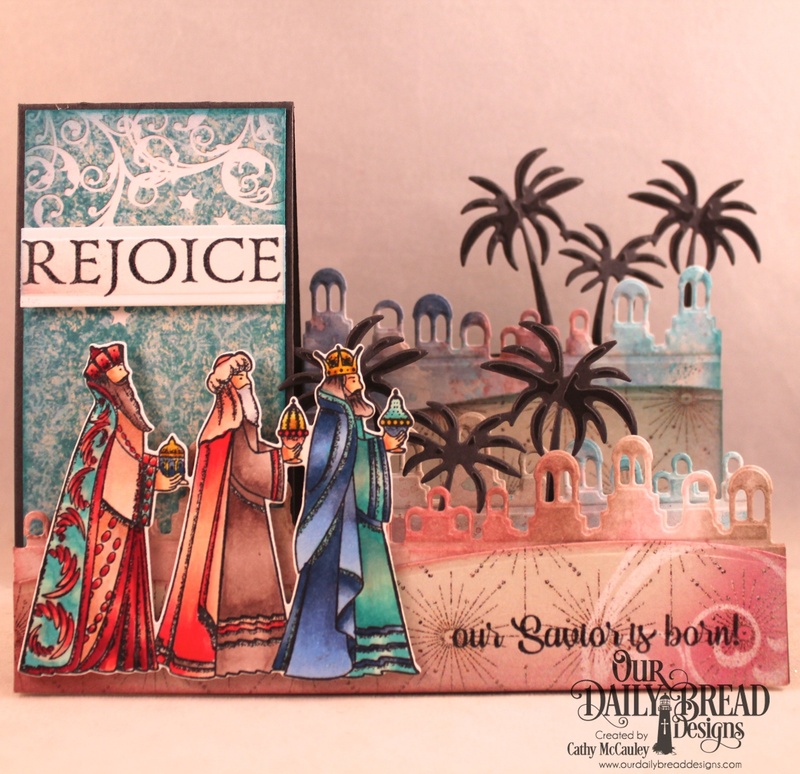 The divider panels inside the diorama were layered with cuts made with the Bethlehem Dies. The sentiment was cut with a Pennant Flag Die and added to the top of the diorama. My second samples made with the new Christmas Greetings Stamp/Die Duo. 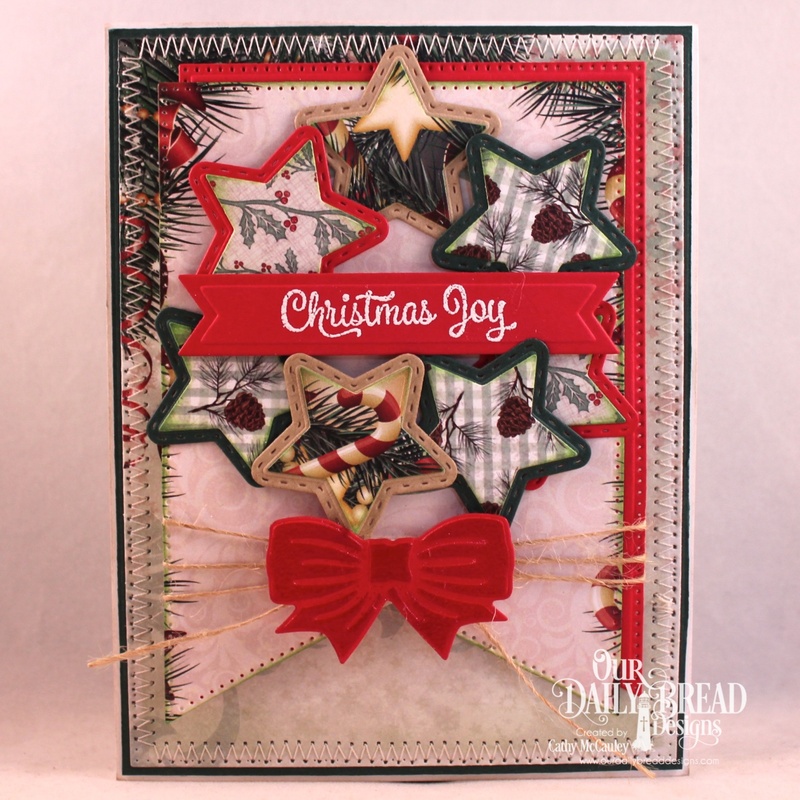 Creative Nugget: Layers of papers from the Christmas Collection 2015 and Christmas Coordinating 2015 Paper Pads were cut with Pierced Rectangle, Double Stitched Rectangle, and Lavish Layers Dies. 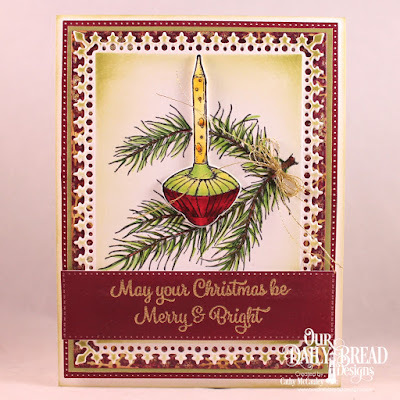 The vintage Christmas light and pine bough from the Christmas Greetings Stamp/Die Duo were stamped on the lavish layers panel and colored with Copic Markers. The sentiment was gold embossed and attached to the bottom of the card. A metallic gold bow was added to the pine bough to finish the card. 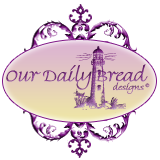 Be sure to check out the Our Daily Bread Designs Blog, Facebook Page, and Instagram to see more beautiful samples created by the Breadbasket Designers using products from the October release. 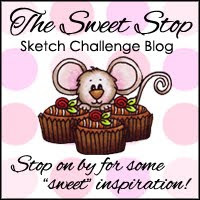 Thanks so much for stopping by...hope you were inspired to start those Christmas cards!